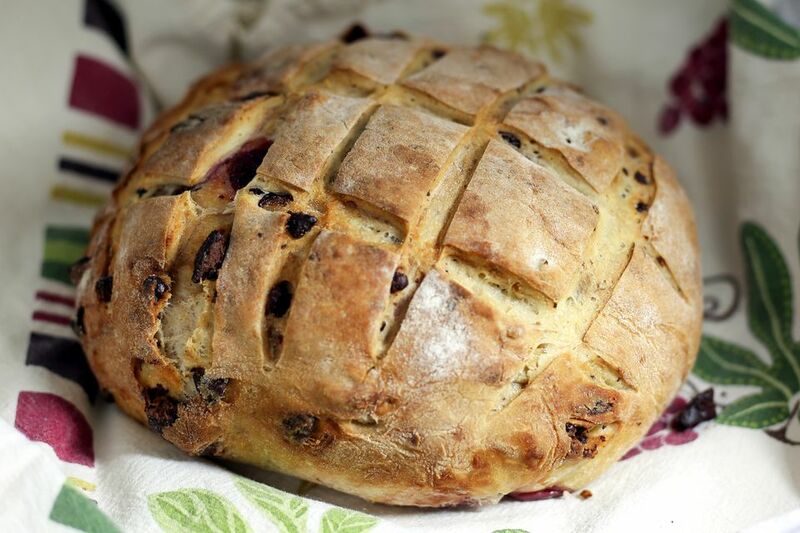 This chocolate cherry bread is a delicious yeast bread. It's a fantastic way to enjoy fresh cherries. Make one or two round loaves ​or make one large or two small braided loaves. To keep the fresh chopped cherries from adding excess moisture and unwanted color to the bread, they are either frozen or slightly dried. Prepare the cherries an hour or more before you begin mixing the dough. The directions call for a stand mixer, but the dough can just as easily be mixed and kneaded by hand. Remove the stems from the cherries; rinse under cold running water. Pit the cherries and then cut them in half or chop them coarsely. Pat them to dry thoroughly and spread them out in a single layer on a baking sheet. Freeze until solid. Alternatively, you may bake the prepared chopped cherries for about 2 hours in a preheated 200 F to dry them slightly. Pat the cherries with paper towels to remove excess moisture and refrigerate them until you're ready to use them. In the bowl of a stand mixer, combine the flour, salt, oil, and honey; stir to blend. Add the yeast and water; stir until the dough begins to come together. Attach the dough hook and knead the dough for about 5 minutes. Add the chocolate and continue kneading until it is well incorporated. Oil a large bowl and set aside. Remove the dough to a floured surface and work the frozen or dried cherries in, a few pieces at a time. Gather the dough up into a ball and place it in the oiled bowl. Turn it over to coat all sides with the oil. Cover the bowl with plastic wrap and set in a draft-free place until doubled in bulk, or about 1 1/4 to 1 1/2 hours. It might take a bit longer if the cherries were frozen when added. Line a large baking sheet with parchment paper and sprinkle lightly with flour. Divide the dough into two uniform pieces (about 21 ounces each) and shape each portion into a tight, smooth ball. Place them on the parchment paper-lined baking sheet. Dust the loaves lightly with flour and cover with a clean kitchen towel. Let them rise for another hour in a draft-free place. With a razor blade or baker's lame, score the bread as desired with even slashes or a criss-cross diamond pattern (pictured). Bake the bread at 400 F for 20 minutes. Turn the pan around and reduce the heat to 375 F; continue baking for about 16 to 20 minutes longer. To check for doneness, insert a reliable instant-read thermometer into the center of a loaf. It should register around 200 F or slightly higher. Makes two 1 1/4-pound loaves or one 2 1/2-pound loaf.